Any New York resident needs to know a few key places in his or her neighborhood. A bodega that actually melts the cheese on their egg sandwiches. A pizza place that's open late on weekends. A yoga studio where the instructors actually wear deodorant. And a pretty decent Thai place. If you're on the Upper East Side, Up Thai should be that place. First things first: the food. It's good! It's not SriPraPhai-good, and is sometimes a bit too sweet, but it also doesn't require a trip to Woodside. Considering this restaurant's location on the same block as the Upper East Side outpost of Bounce Sporting Club, it's a relatively impressive operation. When evaluating local Thai spots, we like to run restaurants through our patented Solid Neighborhood Thai Restaurant Test, which features just one question - "Would you eat anything other than pad thai here?" Up Thai gets an A on that test. There's a whole menu of dishes worth ordering, from peanut-filled dumplings to excellent crispy duck, and that's what helps separate it from your run of the mill joints. With that in mind, dragging your human body over here rather than using your robot arm to press the Seamless buttons is worth considering because the more unusual dishes aren't totally primed for travel - a head-on fish or a "Thai bouillabaisse" suffer a bit from the delivery bag. The other thing that separates it from the slew of Thai restaurants in the area? The space is done up like it's going to the prom. The prom in like, Texas. Or somewhere where the prom is taken seriously. 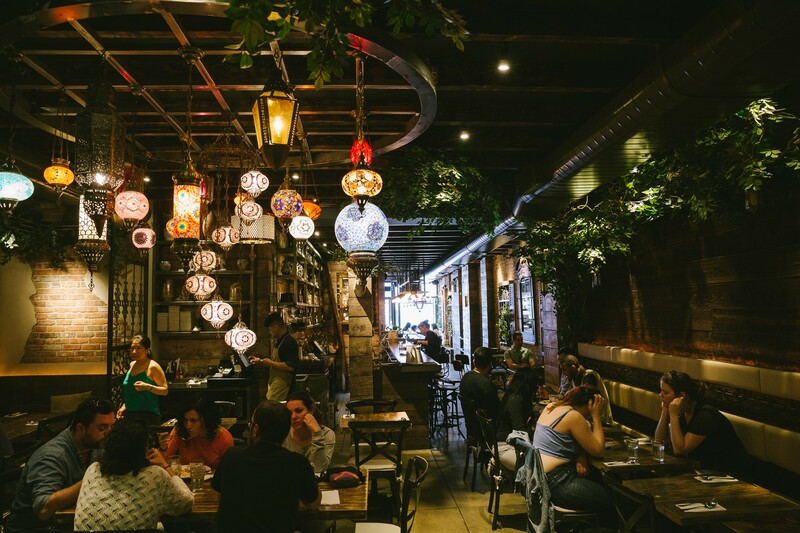 You've got faux rustic brick walls, Persian lanterns, and plants hanging from the ceiling. Despite how that sounds, it actually manages to feel comfortable and almost borderline romantic, rather than like a West Elm that vomited on itself. And sure, the look may not make much sense, but neither does decorating every other Thai restaurant in town like a set for a live reenactment of The Jetsons. Unless you really have a thing for Moroccan garden-inspired interior design, Up Thai isn't a place worth traveling out of the way for. But it's definitely worth having in your back pocket when you're in the area and you need to fill your veins with some Thai food. A twist on traditional dumplings, these are filled with chicken and peanuts, and wrapped in a rice noodle sheet. Up Thai does a nice job on the traditional minced chicken salad known as larb gai. It comes mixed up with chili powder, plus red onion, mint, and scallions. It's light, bright, and a little crunchy - a nice way to start off. Just because you can order other things doesn't mean you should sleep on the pad thai. This is a solid pad thai, made with clearly fresh ingredients. We like the whole crispy red snapper, served with a generous coating of sweet chili sauce, but know what you're getting into. As you can see, a head is involved. This is probably one of those items you'll want to eat on location rather than for delivery. Our waiter described this as Thai bouillabaisse, which isn't far off. It's a big soup with salmon, scallop, shrimp, squid, and mussels. It's an interesting and tasty choice, if you're looking for something seafood-y and a little different. Here's a strong endorsement for this dish of slices of sautéed crispy duck breast and little pieces of eggplant in a tamarind sauce. So crispy. A reliable classic French Upper East Side bistro with one of the best salads of all time. THEP is a solid Upper East Side Thai spot with a long menu, an attractive space, and some outdoor seating.